270 pages | 10 B/W Illus. 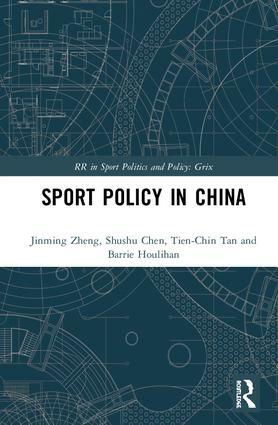 Acknowledging China’s established status as a global sporting superpower, this is the first book to systematically investigate sport policy in that country. With a focus on sport development in the most recent three decades, Sport Policy in China explores a wide range of topics in Chinese sport, including elite sport development, professional sports, major sports events, sport for all, the political context within which sport is interiorised and the distinctive sporting status of Hong Kong. It examines the debates around policy, globalisation, diplomacy and soft power, as well as the significance of the principle of ‘one country, two systems’. With international appeal, this book is a valuable resource for students and researchers in the fields of sport policy, sport management, sport development and sport sociology. Jinming Zheng is a Post-Doctoral Research Fellow working at the Centre for Global Sport & Recreation Studies of the Department of Physical Education at Hong Kong Baptist University, China. He is also an honorary Research Associate of the Faculty of Health and Environmental Sciences, Auckland University of Technology, New Zealand. His research interests include elite sport policy in a broad range of Asian and Western nations, Olympic studies, football governance, and sport and international relations. Shushu Chen is Lecturer in Sport Policy and Management at the University of Birmingham, UK. Her principal research interests include sport policy and management and Olympic studies (particularly in the areas of Olympic legacy evaluation). Her recent research projects examine policy and management issues of sport in China. Tien-Chin Tan is Professor of Sport Sociology and Policy at National Taiwan Normal University, Taiwan. He is also an Editor-in-chief of Sport Studies, a Corresponding Editor of International Review for the Sociology of Sport (IRSS) and a Guest Editor of Sport in Society. His main research interests are public policy for sport, particularly in the areas of Olympic studies, elite sport development, professional sport, sports industry, youth sport, and school-based sport policy in Taiwan and China. Barrie Houlihan is Emeritus Professor of Sport Policy at Loughborough University, UK, and Visiting Professor at the Norwegian School of Sport Sciences, Norway. He was the founding Editor of the International Journal of Sport Policy and Politics. His research interests include the domestic and international policy processes for sport, with a particular interest in sports development, the diplomatic use of sport, and drug abuse by athletes.